All students attending STM Catholic will be expected to abide by the uniform dress code established by the school. All uniform items must be purchased from Dennis Uniform or Educational Outfitters, except: white oxford dress shirts, white blouses, required belts, and socks. Shoes may be purchased anywhere but must be neutral. Tennis shoes must be worn on PE days. Uniform shorts may be worn the first and last trimesters ONLY. Uniform items should be clearly marked with the student’s name. Lost and Found is available for any missing items. During the colder months, STM Catholic does offer classroom approved STM sweatshirts available through our Spirit Shop. Ordering periods are 3x per year. No other “logo” sweatshirts are permitted to be worn within the classroom but can be utilized during recess. Students should wear the “dress uniform” on Friday for Mass and other days when they are attending Mass. Students should not plan to change into uniform shorts after Mass on Fridays. 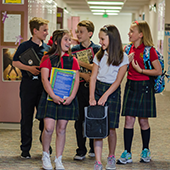 Eighth-grade boys may wear khaki slacks, and 8th grade girls may wear a khaki skirt or slacks (both are available from Dennis Uniform and Educational Outfitters), as part of their casual and dress uniform. Shirts, blouses, and turtlenecks must be worn tucked inside the pants, skirts, skorts, or shorts. Occasionally, students will be allowed “Dress-down”, “Theme”, or “Dress-up” days. Parents will be notified of these occasions in advance. Students may always wear an approved uniform instead on these days. More details on uniform policies and specifics, please refer to our full dress code document.